Two are the semi-comic ones of Captain Grimes and Paul Pennyfeather, or so Evelyn Waugh similarly titles them as chapter-headings in Decline and Fall. To describe the form they take would spoil the pleasure of the absurd plot, if you haven't read the book or watched the new BBC three-parter. I do remember at university wondering why on earth we were studying such pieces of fluff as this and Vile Bodies, but the serialisation reinforced that the dialogue is so crisp, sharp and laugh-out-loud funny. All credit to the director and cast for making it consistently so on the screen. 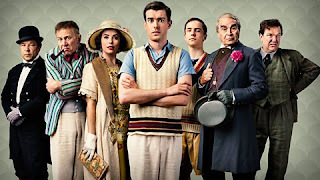 I think lad-comedian Jack Whitehall surprised everyone with his pitch-perfect Paul, and though I saw other performances traduced for being too broad-brushstroke, that's surely how Waugh paints them. The main thing, again, is that I laughed a lot at Douglas Hodge's unsquashable Grimes, David Suchet's Dr Fagan ('it do, it do' being one of the funniest rejoinders in the whole thing - you need the context), Stephen Graham's Philbrick and sundry minor caricatures. I warmly agree with every word of Mark Sanderson's review on The Arts Desk. I could ask no more of it than the fact that I've gone back to my old Penguin copy (pictured up top), and who knows, I might continue with a Waugh binge. 'The' resurrection, about which I feel a little like Philip Pullman in The Good Man Jesus and the Scoundrel Christ, is a bit of a sticking point. Can we just take it as a metaphor or a parable, as Rupert Shortt suggests in his otherwise unproblematic (for me) God is No Thing? Perhaps, at least on Easter Day, when we need a 'triumphant' shout after the suffering of the Passion. 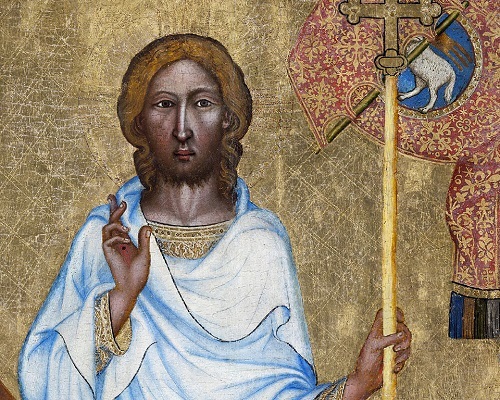 Anyway, it allows me to put up one more detail from the glorious Vyšší Brod Brod altarpiece, and this superb minimalistic finale of Rachmaninov's Suite No. 1 for two pianos, eventually matching the bellsong of the happy morn with the same 'Christ is Risen' chant Rimsky-Korsakov uses in his Russian Easter Festival Orchestra. Forgive the poor picture, but the sound and performance of Lilya Zilberstein and Martha Argerich are terrific here. In the meantime, I leave you with a somewhat sacrilegious Easter greeting - either message may be adopted - which has been widely circulated by us from home today. I generally have no idea when Easter is apart from blog friends or shop decorations. It bothers me, where we live, that there's an assumption everyone celebrates Easter, when of course it's not the case. This doesn't happen in our neighborhood in NYC, needless to say. All that said, your last image cracked me up. Many maybe most of Waugh's books - including Decline and Fall - are satires. They are not about what they appear to be about. Some are rather nasty. But his satires on the army and social structures are so brilliant as to make one gasp. Perhaps this dimension is being progressively lost now that the social structures he describes have faded.The difficulty with films and plays of novels is that they tend to display the plot, which is only the skeleton on which the flesh of the real message is hung.I remember seeing two films of Maupassant stories in which the full spirit of Maupassant came through. But this is rarely achieved. In some cases it is impossible, as in the case of Wuthering Heights. Sue - the nice thing about Easter is that you can celebrate it as the coming of Spring or the Christ thing. The word comes, it seems, not from 'Ishtar', the eastern fertility goddess, but an Anglo-Saxon one, 'Eostre', who loaned her name to the month of April. 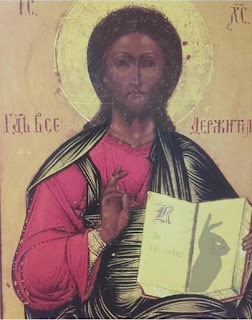 Whatever the case, I like the period of sombre quiet for Good Friday and Easter Saturday, and the sense of real rebirth we get on Easter Sunday. In America, it seems, it's almost entirely about gorging on eggs and dressing up as sinister bunnies. On the reading front, how are you getting on with Esterhazy's Celestial Harmonies? David - spot on, I think. What remained on TV was a fine exercise in style and some very, very funny performances. Since most of the book is dialogue, Waugh handed it on a plate, and they didn't let him down. David: I love your tracing of the etymology. I'm afraid here there is not much somber quiet, which would be preferably to all the marshmallow bunnies and such. I loved Celestial Harmonies. I'm so glad you noted it, or I would never have known. The first book is a bit bewildering, but the thing to do is just immerse yourself and see where you go. It's a tour de force, and so rich with layer upon layer of history. Many try, but few succeed, and he succeeded. In this respect, what he achieved reminds me of the Portuguese novelist António Lobo Antunes, also brilliant in dealing with the long sweep of history, though he accomplishes it in a very different way. The first book is VERY bewildering - where are we, with whom, in which century? And there's a great deal of Hungarian history which I imagine Esterhazy's native readers take for granted. But still the playfulness always led me on. Now I must read Antunes, to return the compliment. Perhaps try "The Splendor of Portugal," or "The Return of the Caravels." Your description of the Esterhazy, BTW, perfectly describes my experience, without native reader knowledge, of reading both Celestial Harmonies and Antunes. I really can't fathom how Esterhazy pulled the novel off. Just remarkable. I do hope there will be a chance to connect while we're in London. It would be lovely to see you both--and so much on which to catch up! The style is a bit reminiscent of Esterhazy, but even more of W G Sebald, whom I adore, but who makes life a bit difficult by not breaking things down into paragraphs. Does Antunes go on for pages without breaks? We will see you in London without a doubt. Now I'm back I shall sort out the diary and see what's on and how we can meet. You will also finally meet Sophie, who is staying with us while she has a minor op (if it happens - true to its overstretched form, the NHS can't confirm whether the operation tomorrow will take place or not). Ah, Sebald! I don't have My Antunes to hand, but I don't believe he tends to do that, though worth do check when you run across the books, as memory is frail--or at least mine is. And yay about London and (hopefully) Sophie! Doing some diary 'reconciliation' at the moment and shall get back to you. Sophie is currently awaiting her operation at Hammersmith Hospital - she's been there since 8am and still has no idea when or even if it will happen, though it's looking likely. We know from our very revealing BBC documentary about the NHS what a state it's in, and how all people working in hospitals are doing their best under near impossible circumstances. Longing to know how Rosenkavalier was for you this time.